Paris‘ iconic Notre-Dame Cathedral is currently being engulfed in flames on April 15, 2019. The fire has spread rapidly across the building, with shocked and devastated onlookers sharing photos and videos on social media. The 850-year-old monument is known for architectural features such as a choir and apse, a short transept, and a nave flanked by double aisles and square chapels. The central spire at the front of the building, added during a restoration during the 19th century, is a highly recognizable feature of the historic building. 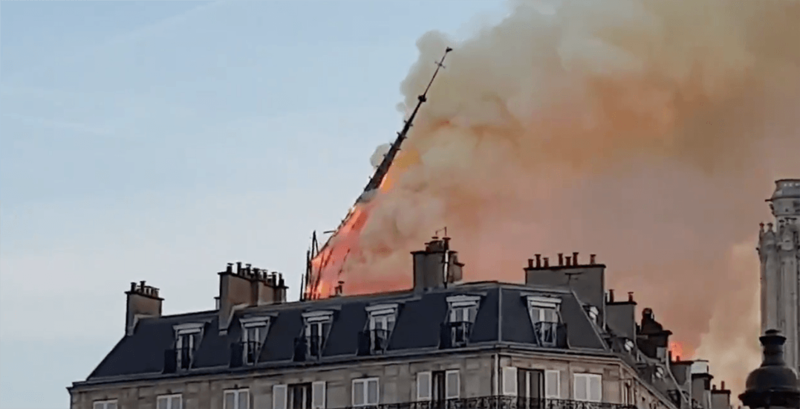 Videos showed smoke and flames billowing amongst the towers, and and at approximately 8 pm CET on April 15, 2019, the spire succumbed to the flames and collapsed. The collapse was captured by heartbroken viewers and shared on social media. #BREAKING: Spire collapse at the Norte Dame fire.